International Delight vs. Starbucks Frappuccino cold coffee beverages. Does cheaper mean worth buying? As far as I’m concerned, Starbucks popularized the cold, sweet, milky coffee market, and brought it into the mainstream. Sure, some of us knew about Mr. Brown Iced Coffee before the Frappuccino landed, and other products innovated long before Starbucks decided it wanted a piece of the action. That’s a given. But since the Frappuccino hit, other companies have been piggybacking on their success – powdered mixes, café knock-offs, etc. Most try to undercut on price, knowing not everyone wants to pay a Starbucks premium for a cold coffee drink. Before we go further, it’s important to distinguish between a Frappuccino blended beverage made with a blender at your local Starbucks café and the bottled Frappuccino “coffee drink.” The bottled drink is usually found on store shelves, as well as in the cooler at Starbucks cafés. In contrast, the blended beverage is made using ice cubes and a mix of coffee, cream/milk, sweeteners, etc., and is turned into a coffee smoothie by a barista. Yes, I know this is confusing. Also, for the purposes of our test, I chose to use the mocha flavour from each brand. Because I’m the one stuck with the leftovers. The Pitch: No pitch on the Starbucks, as it’s the one to beat. With the larger carton size, International Delight has more room to sell us on its awesomeness: “Great beans make the difference. Our refreshing Iced Coffee is made from 100% Arabica coffee blended with real cocoa, milk, and cream for a perfectly balanced taste you’ll love.” And on the other side of the carton: “Bring the coffeehouse to your house. Now the creamy, delicious taste of premium Iced Coffee is as close as your fridge! Our delicious Iced Coffee is ready to drink right from the carton. Just shake well and pour over ice. Savour the ideal balance of rich coffee taste and sweetness, perfect as an afternoon pick-me-up or evening treat.” ADVANTAGE: International Delight. Availability: International Delight is at Co-op, and likely elsewhere. Starbucks is much more befitting of the “International” claim, seeing how they’re everywhere. ADVANTAGE: Starbucks. The Packaging: Milk carton with a plastic screw-top opening vs. nice glass jar with a wide mouth and metal cap. While you could technically drink straight out of both, I’d feel very teenaged chugging from a milk carton. ADVANTAGE: Starbucks. The Look: The Frappuccino looks creamy, while the International Delight is a darker hue, like coffee with a splash of milk instead of a splash of cream. ADVANTAGE: Draw. The Taste: The Frappuccino is sweet and creamy, with an emphasis on the dairy; the coffee used tastes like a dark roast (though also a little bit like Via, the Starbucks instant coffee brand), which keeps with the signature Starbucks taste profile. ID is more milky than creamy, and less sweet; while it tastes like coffee, it’s not a dark, intense coffee flavour. On its own, International Delight is OK, but next to Starbucks there’s no comparison: the ID is bland and uninspired. ADVANTAGE: Starbucks. Nutrition? : Starbucks: Per bottle (405 mL): 260 calories, 4.5 grams of fat, 140 mg of sodium, 1 gram of fibre, 9 grams of protein. International Delight: Per 1 cup (250 mL): 160 calories, 3 grams of fat, 110 mg of sodium, 0 grams of fibre, 4 grams of protein. Want me to do the math? 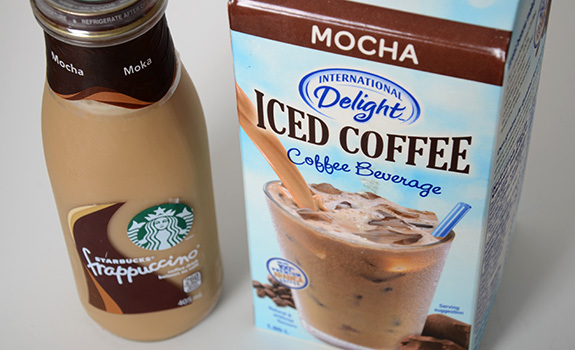 By my math, 405 mL of International Delight Mocha Iced Coffee Beverage would contain: 259 calories, 4.7 grams of fat, 178 mg of sodium, 0 grams of fibre and 6.5 grams of protein. In short, very similar. ADVANTAGE: Draw. The verdict: Starbucks’ Frappuccino is clearly the better drink. But if you’re the kind of person who buys tubs of off-brand generic ketchup instead of Heinz because it’s 13 cents cheaper per litre, go nuts.